> Be rewarded> Inside or outside parking ? Because we like to thank our most trustfull customers, we constantly upgrade them : even if you have booked our outside car park, there are very good chances your car might be parked inside. In fact, our inside car park facility being rarely 100% full, we give our best customers who have chosen our outside car park an upgrade at no extra cost so that their car is finally parked inside. - Of course, all our inside parking customers, whoever they are or how frequent they are, have their car parked inside. - When we have available inside parking places, we systematically fill them with cars booked outside : first our customers who bought our one year unlimited offer for 2900€ and then those who use frequently our prepaid offers. Of course, when we have to make a choice, we treat our customers with identic profiles in an equitable way. And what about upgrades for our best inside parking customers ? Not to worry, they get also a special treatment : if you bought our one year unlimited offer for 3600€, you get 4 free outside or inside car washes per year at no cost. 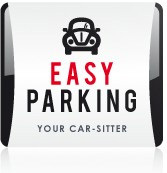 At Easy Parking, you really are in good hands !